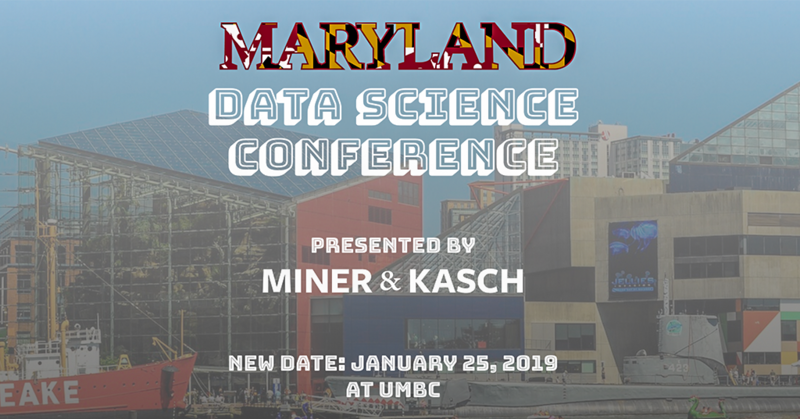 Miner & Kasch, a AI and data science consulting firm founded by two UMBC alumni, will hold a one-day Data Science Conference at UMBC on Friday, January 25 in the Linehan Concert Hall of the UMBC Performing Arts & Humanities Building. A limited number of free tickets are available for current UMBC students. To attend, you need to register here. The event was originally scheduled for January 14, but had to be rescheduled due to inclement weather. If you had registered and obtained a ticket earlier, you will need to re-register. The event brings together local companies and professionals to share what new and exciting things they are doing with their data. It will be attended by business managers, startup founders, software engineers, data scientists, students, and other curious people that want to learn more about the cutting edge of data science, machine learning, and AI. See the conference website for topics and speakers.